Tropical Chic is bright and bold. Welcome to my blog. Today a whole bunch of Stampin’ Up! demonstrators in Kylie Bertucci’s Demonstrator Training group are hopping. Hopping mad? ….. Nope. Hopping on one leg? …. Nope. Blog Hopping! 🙂 We have all posted on our blogs at the same time and linked those posts together in a blog hop list, so you can “hop” from one to another. Seemples! The complete list of hoppers is at the bottom of this post. So grab a cuppa, sit back and enjoy checking out what everyone has created with Stampin’ Up! products. 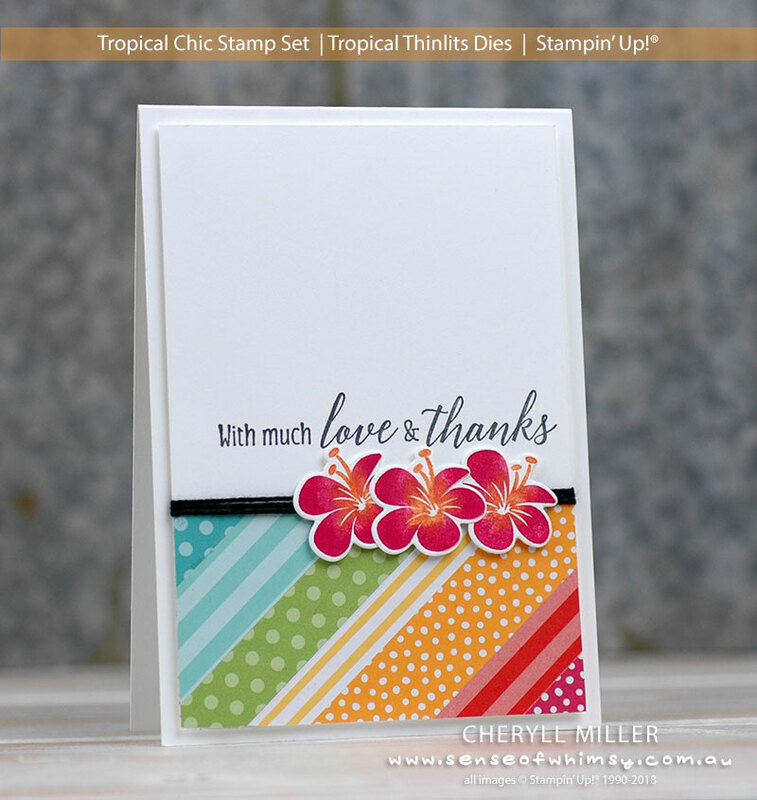 The Tropical Chic Stamp Set and Tropical Thinlits Dies are in the Stampin’ Up! Annual Catalogue and come bundled for 10% discount. 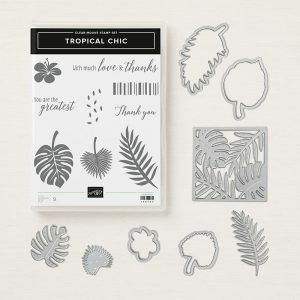 Bundle includes Tropical Chic Stamp Set and Tropical Thinlits Dies. This card has only a few elements, but they pack a colourful punch. 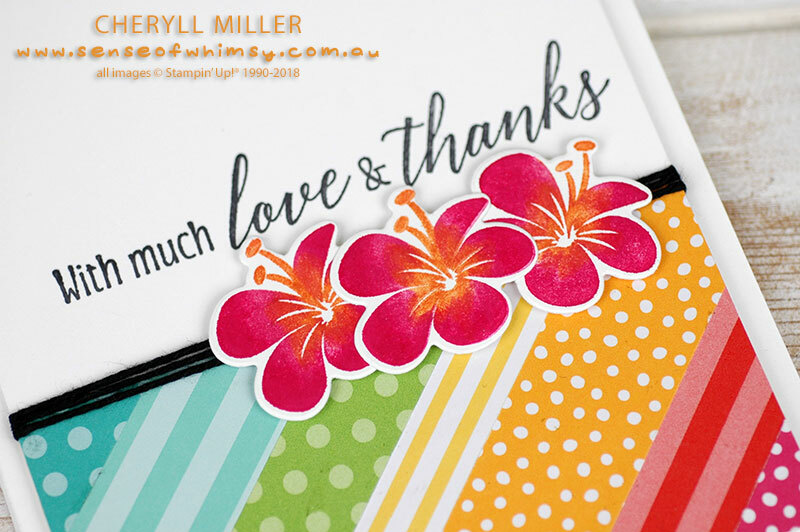 The hibiscus flowers have multiple colours applied to the stamp using a combination of Stampin’ Write Markers and ink applied with a sponge dauber. 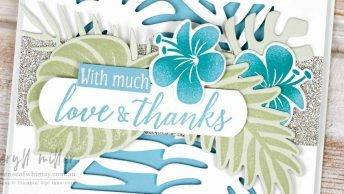 Using the Stamparatus makes this job super easy because you can apply the Pumpkin Pie Stampin’ Write marker first, and then apply the Melon Mambo ink around the outside the petals with a sponge dauber, and stamp over the first image. Now blend the two with a Melon Mambo Stampin’ Write Marker. I love that you can continue to add the colours until you have a vibrant, multicoloured flower. The very bright striped and spotted paper are scraps of the Brights Designer Series Paper cut into strips and adhered to a piece of white card with a thin layer of Multipurpose Liquid Glue. Use extra long strips and then trim them all off to the size you require afterwards. A pop of black is perfect with the bright colours – The join between the white card and the bright patterned paper is covered by wrapping black Baker’s Twine around the card multiple times. The black really pops out on this very busy background. Leave lots of white space – Don’t be tempted to fill all that white space. Because the other elements on the card are so bright and all placed towards the bottom of the card, balance it out by leaving lots of white space above. The Stampin’ Up! demonstrators in this hop come from all around the globe, the mix of different styles will be amazing. So take ten minutes for yourself, grab a cuppa and hop around all the different blogs for a ton of inspiration. Stampin’ Up! has announced the release of new Stamparatus Accessories. Oh wow, I love this card, your colours really caught my eye, thanks for sharing it! What a sunny card and nice to see this set with bright colors. What a bright cheery card. The white space makes all the bright colours really pop! Stunning Card – love the color combinations. I love your card. It’s really colorful! Stunning card Cheryll! Love the DSP at the bottom! I’ll be casing that idea! I love this! So clean, simple, bright and cheery! 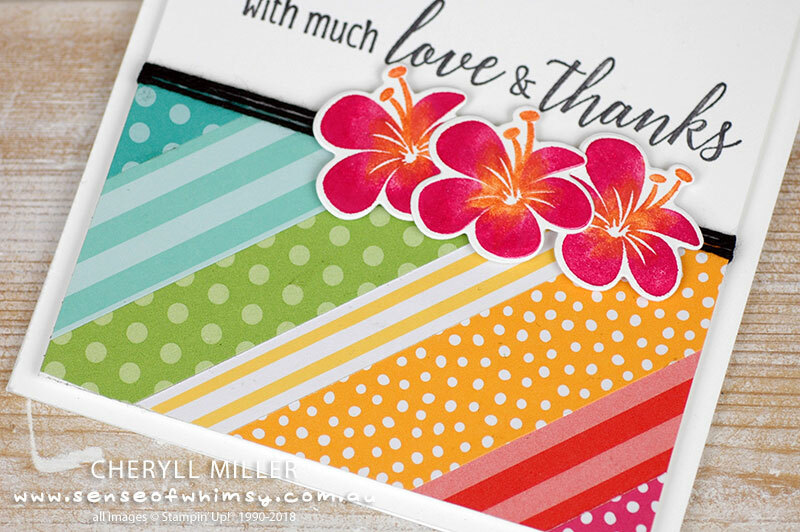 This is so bright and fun Cheryll…love it! Love the way you have used the papers in this design.